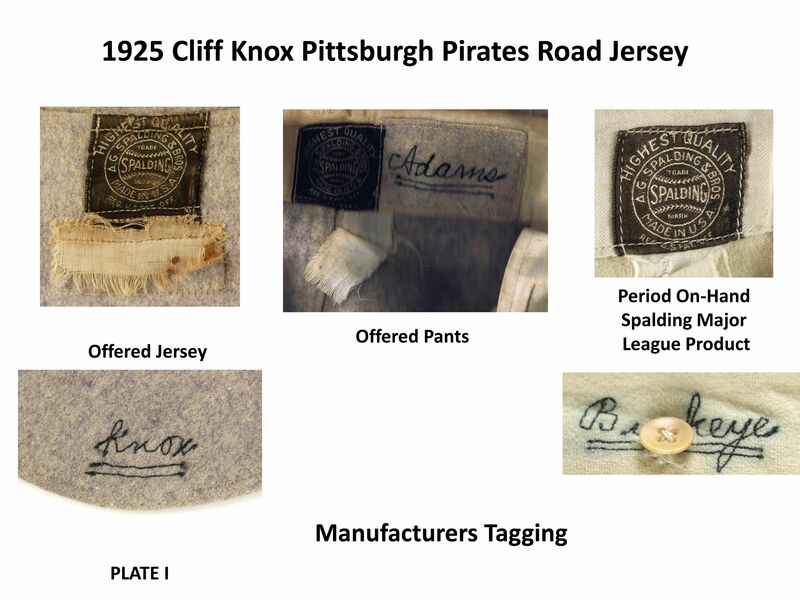 Lot Detail - 1925 Cliff Knox Pittsburgh Pirates World Champions Season Game Worn Road Uniform w/ original 25th Anniversary Patch (MEARS A9) Only Known Example! 1925 Cliff Knox Pittsburgh Pirates World Champions Season Game Worn Road Uniform w/ original 25th Anniversary Patch (MEARS A9) Only Known Example! Collectors of pre-war flannel jerseys know how rare any team can be to acquire. 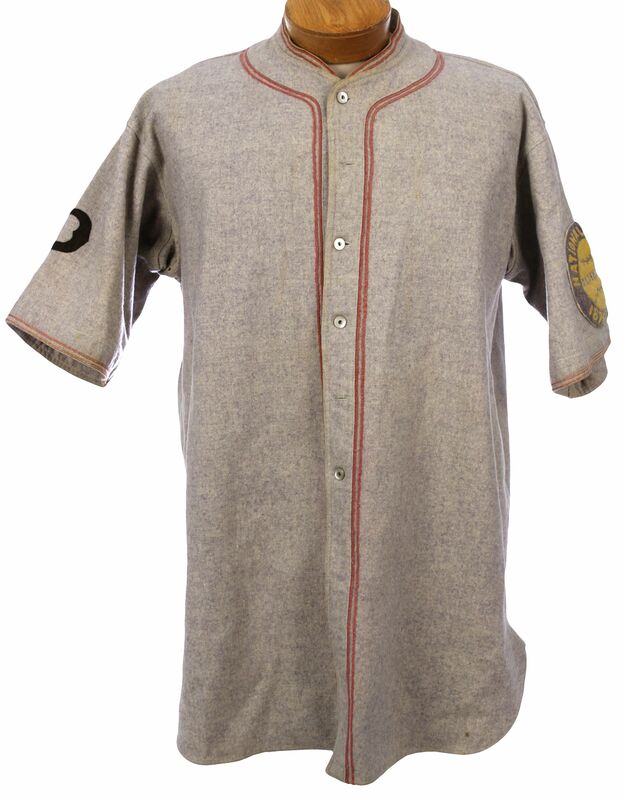 Simply stated, 1920s big league flannel jerseys are incredibly scarce, with only the most advanced collections containing any examples. 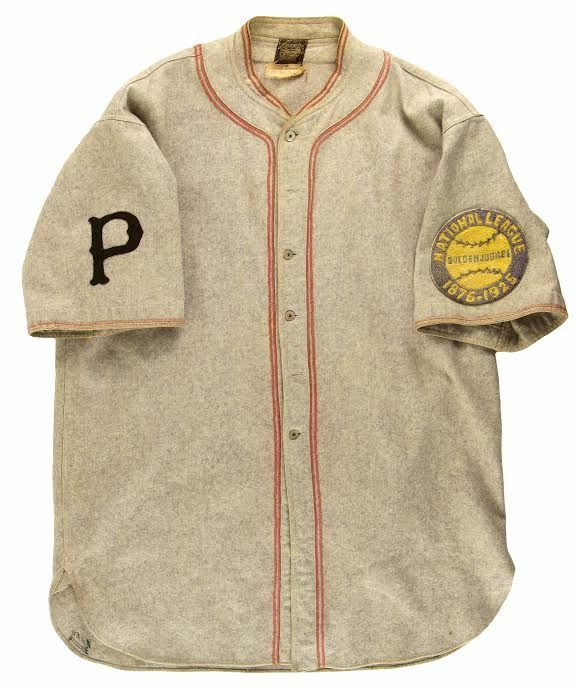 For this lot, MEARS Auctions is extremely excited to present an all original 1925 Pittsburgh Pirates Game Worn Road jersey dating to their World Championship season, and containing the elusive and 100% all original National League Golden Jubilee (1876-1925) shoulder patch. The shirt is accompanied by a pair of original and properly styled period pants that complete the uniform. 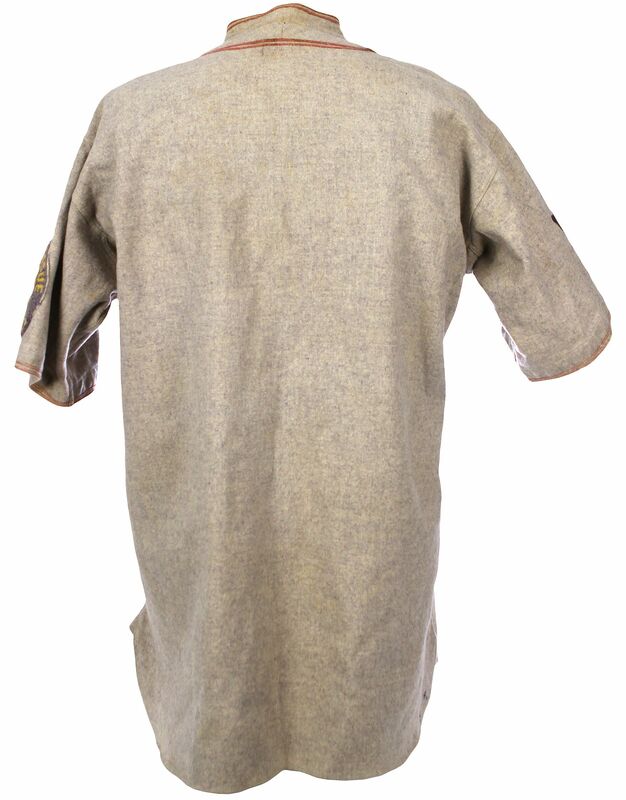 To our knowledge, this is the only surviving 1925 complete Pittsburgh Pirate uniform in the hobby, no other shirts are known to have survived. The jersey originated from the estate of Clyde Barnhart. His name is not chain stitched, former Pirate Cliff Knox appears as the player of jersey issue. 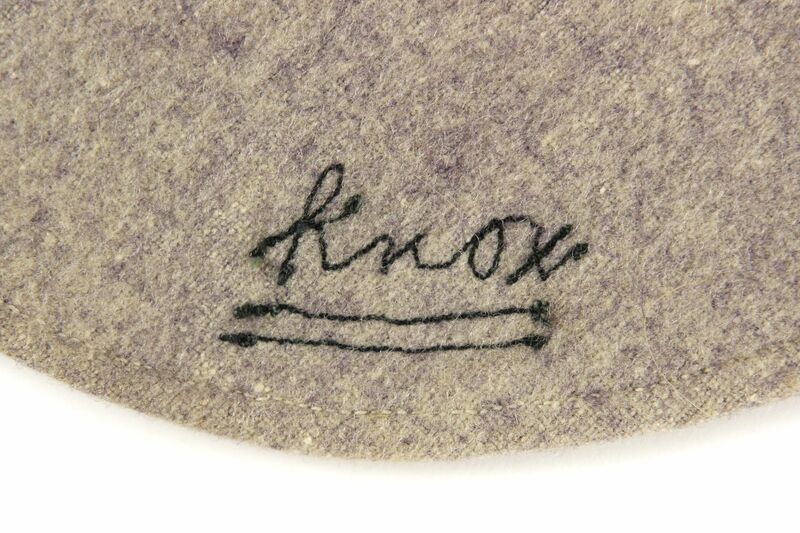 As stated, the jersey is attributed to Cliff Knox based on the name “Knox” done in in-line embroidery in the tail. References such as Total Baseball and Baseball reference.com sow Knox as being a member of the 1924 Pittsburgh Pirates. The same references have no record of Knox with the Pirates in 1925. 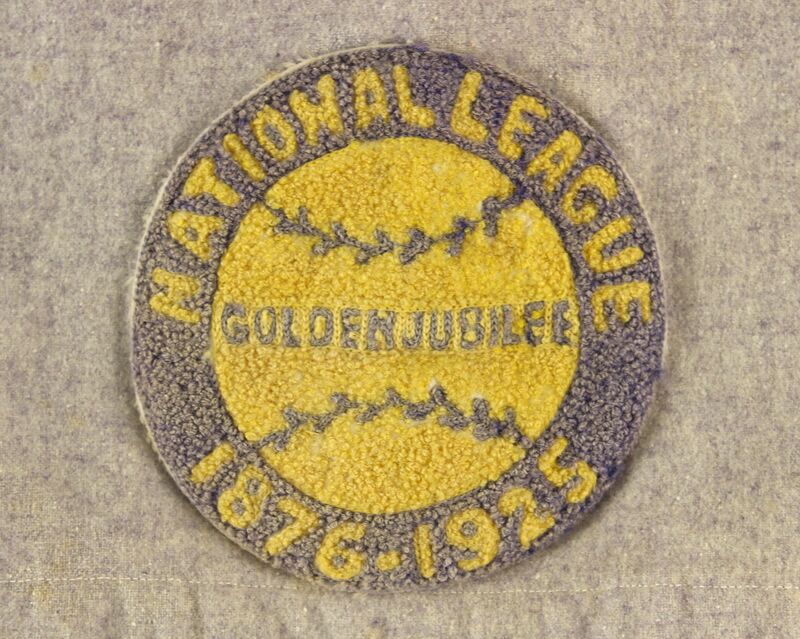 The jersey also features a period original 1925 National League Golden Anniversary patch. 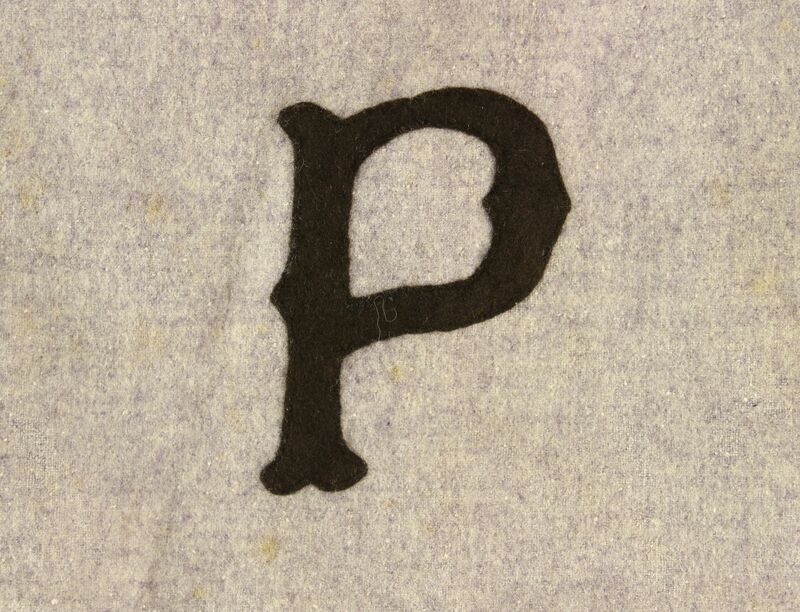 Examination of the jersey reveals no signs that a “P” as is present on the right shoulder, was ever applied to the left shoulder. The combination of this information with the above time line indicates to me that the jersey is a 1925 offering ordered for Knox by the Pirates during spring training in preparation of the 1925 season and subsequently issued to Knox and worn by him until he was released by the club some 10 days after the season started. 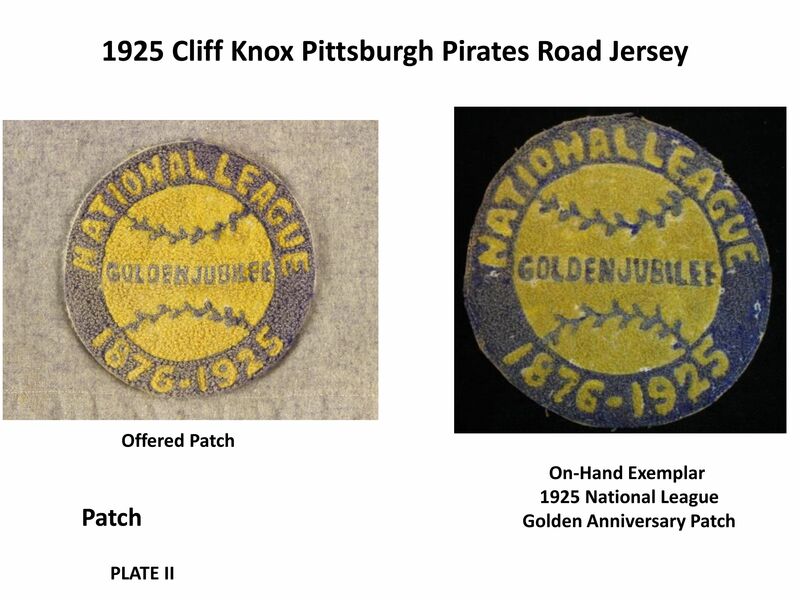 This is an important distinction to make as opposed to the jersey being a 1924 Knox offering carried forward to the 1925, having the “P” on the right shoulder removed and the 1925 Golden Anniversary patch added. Size: The jersey is without any sort of tagged or annotated size. This is not atypical of major league uniforms of this time frame. Static sizing data for Knox lists him at 6’; 170lbs. The measured size of the jersey suggests something in the order of a size 42. As such, I would consider this to be an appropriate sized jersey for Knox at this point in time. 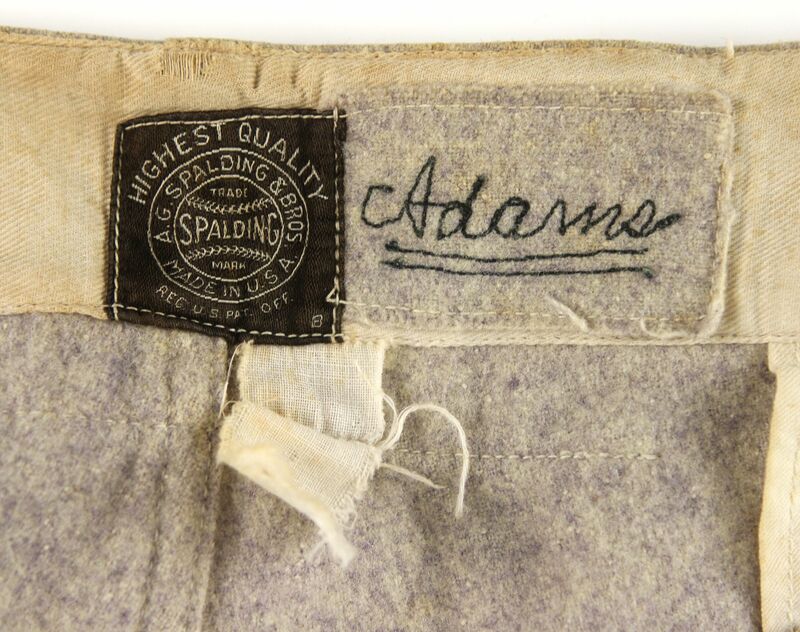 The jersey is accompanied by a pair of pants that are attributed to Babe Adams (Pirates 1909-1926) and these appear to of a size 34 with a 24” inseam. These appear consistent with sizing data for Adams as well (5’, 11”; 185 lbs). Use and Wear: The jersey shows signs of light use and wear with the pants showing a bit more. 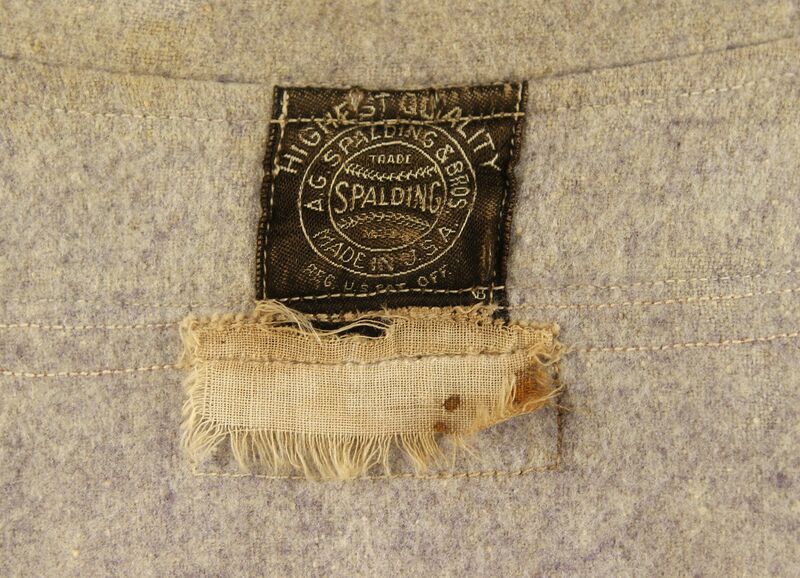 Both garments are assessed as being in well above average condition given the vintage of the artifacts. With specific respect to the jersey, the overall condition of the body of the garment is virtually un-improvable with respect to fabric surface wear, absence of any appreciable holes, staining, or fabric tears. The jersey is however missing two buttons and features very minor fraying to the soutache on the right rear-neck line. 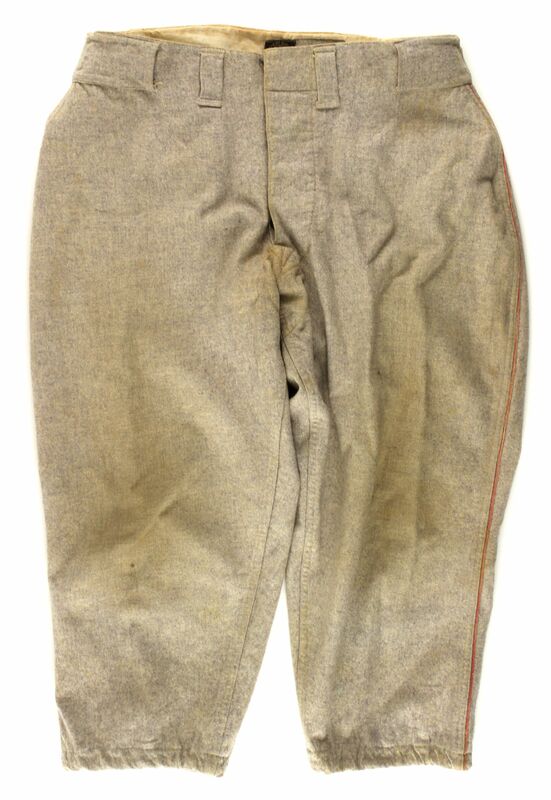 The pants are in equally sound condition with some soiling and staining in the crotch area, missing button on the right rear pocket, as well as the fact that the closure system (both parts present) has come free from the anchor stitching (easily repairable). As such, the size of these garments may have precluded them from being worn by Barnhart in all but the most extreme situations, and as such the uniform is not attributed to Barnhart with any degree of certainty or objectivity, other than possible source/origin to the hobby. This would also be consistent with the current overall condition with light use and wear. Opinion: It is my opinion that this jersey possess all the characteristics I would expect to see in 1925 Pittsburgh Pirates road jersey provided by Spalding for road use by Cliff Knox in that same year. The jersey is assessed as being original and without any signs of alteration or contrived application, use or wear. The same is said for the accompanying Babe Adams pants. Category 5: Frayed Soutcahe; -0. No points were deducted for this given the nature, size, and location; but it is noted for the sake of accuracy. Category 5: Light use/wear. -0. No points were deducted from the jersey given what we know about the duration of time that Cliff Knox spent with the Pirates in 1925 and the size issues that make regular use by Clyde Barnhart a less likely possibility. This is also why no points were deducted for this being considered a “two player” jersey (-3). Auction closed on Sunday, March 2, 2014.